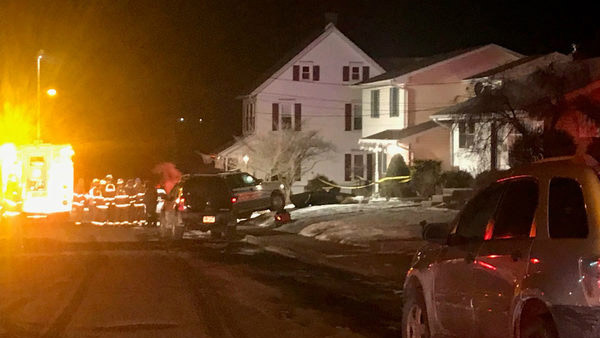 NORTHAMPTON BOROUGH, Pa. (WPVI) -- Authorities say a shooting that left two people dead in Northampton Borough, Pa. was a case of murder-suicide. It happened in the 300 block of West 27th Street around 9:45 p.m. Tuesday. Citing coroner Zachary Lysek, WFMZ-TV reports that Matthew Eberhardt, 45, fatally shot his wife, Kristin Eberhardt, 42, before turning the gun on himself. One of the bodies was found in the front yard of the home. Kristin Eberhardt was shot multiple times and her death was ruled a homicide, the coroner said. Matthew Eberhardt's death was ruled a suicide. Officials said two children were inside the home at the time of the shooting, but they were not harmed.